More and more people — a total of 43 million in 2016 — are renting and wondering “how much rent can I afford.” And they’re paying more and more for the privilege of renting as well. According to the U.S. Census 2015 American Community Survey, 47.7% of American renters are cost-burdened, meaning they spend more than 30% of their income on housing costs. As the renter population grows, and rents continue to increase, the number of housing burdened households is likely to grow. In a previous report, ABODO identified the cities with the most cost-burdened renters, and examined the extent to which HUD subsidies could addressing the issue. Our new report takes a closer look at the cost-burdened renters themselves: Which generations have the highest percentages of cost-burdened renters? Where are they, and how do their incomes relate to their rent? “How much rent can I afford” is the obvious question. No generation is exempt from significant housing cost burdens as renters, though Gen Xers are faring best. The data also shows, however, that homeowners largely live in a different world, financially speaking. Nearer to the beginnings of their careers and adult lives, Millennials — who wonder constantly “how much rent can I afford” — now ages 18 to 34, are lower earners who haven’t had as much time to save up extra funds for emergencies or rainy days. Overall, 30.5% of Millennials face a housing cost burden, while 46.5% of renting Millennials do. However, these renting young adults are less likely to be housing cost burdened than their older parents and grandparents, even though a recent report by the Federal Reserve found that Millennials earn about 20% less than Boomers did as young adults. Nearly half of renting Boomers (49%), ages 51 to 69, face a cost burden, compared with just 46.5% of renting Millennials. 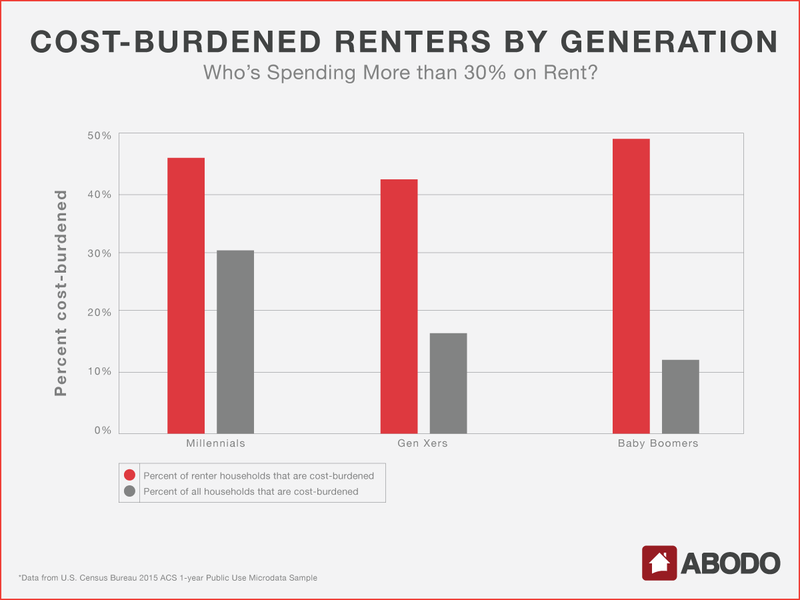 Interestingly, the generation with the highest percentage of cost-burdened renters is also the generation with the lowest percentage of cost-burdened households overall. When you include homeowners, only 11.6% of Baby Boomer households face a burden. 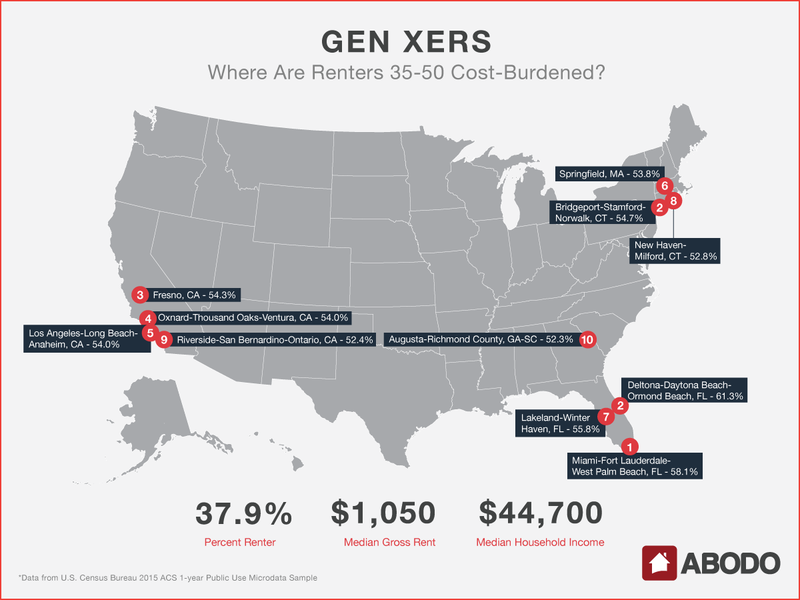 On the other hand, Gen Xers, ages 35 to 50 with (hopefully) more established careers, fare the best as renters, with just 44.1% facing a cost burden, while falling in the middle of the pack for all households, with 16.8% cost-burdened. These extremes, most noticeable among Baby Boomers, indicate that homeowners tend to be more financially secure. But can we blame low incomes, or high rents? Millennials have the most renters of any generation by a wide margin, with 65.5% of the generation tied to leases. These Millennials are paying a median gross rent — meaning utilities and related costs are included — of $980 on a median household income of $39.900, which equates to 29.5% of income spent on housing. As a generation, Millennial renters overall are hovering around the cost-burden mark. 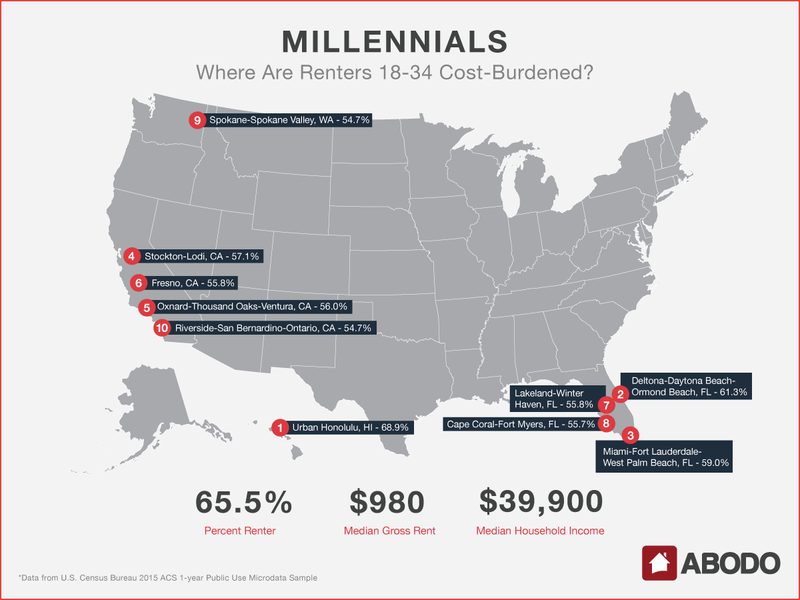 As mentioned above, 46.5% of Millennial renters are cost-burdened, but in some areas, that portion is much higher. Renting Millennials in Urban Honolulu, HI, have an especially difficult time, with more than two-thirds (68.9%) facing a cost burden. Deltona-Daytona Beach-Ormond Beach, FL, is close behind, with 61.3%. Florida and California are exceedingly hard hit: Eight MSAs in our top 10 for highest percentage of cost-burdened Millennial renters are in those two states. Every MSA in our top 10 — which includes Miami-Fort Lauderdale-West Palm Beach, FL (59%); Fresno, CA (55.8%); and Spokane-Spokane Valley, WA (54.7%) — is well over the 50% mark. Millennial money is a huge talking point with innumerable accompanying studies that oscillate between commending and condemning the largest generation in history for their financial management. A recent study, however, shows that Millennials are concerned about their money, too: 67% say their financial stress plagues their thoughts and productivity at work. Many Millennials turn to sites like money gator to help them get their finances in order. They aren’t just oblivious to the importance of money. Considering that 80% of Millennials want to become homeowners — though only about a third have been able to hurdle the down payment — and are still falling below the cost burden mark in such high numbers, that stress seems inevitable. It might be hard to imagine any of the characters in Reality Bites or Slackers owning a home, but our data indicates that many of them do. Only 37.9% of Gen Xers rent — not small change, to be sure, but a far cry from the 65% of Millennials who do. And unlike Millennials, the majority of Gen X non-renters aren’t living with parents or in college dorm rooms. On the whole, fewer Gen Xers are cost-burdened than Millennials or Boomers. Although they pay the highest rents ($1,050), Gen Xers also have the highest median income ($44,700). A few of the MSAs where Gen X renters are most cost-burdened will look familiar. Miami-Fort Lauderdale-West Palm Beach, FL, takes the top spot, with 58.1% of Gen Xers spending more than 30% of their income on rent. In Fresno, CA, 54.3% of Gen Xers are cost-burdened, and Oxnard-Thousand Oaks-Ventura, CA, which was fifth on the Millennial list, comes in fourth, with 54%. Riverside-San Bernardino-Ontario, CA, brings up the rear at #9, with 52.4% of Gen Xers experiencing a cost burden. In each of these MSAs, the percentage of Gen X renters who are cost-burdened is lower than the percentage of Millennials who are cost-burdened. But not by much, and in each case, the percentage is still above 50%. This indicates that though many Gen Xers might be aging out of the rental market in favor of homeownership nationally, in expensive cities like Miami or Riverside, Gen Xers face many of the same struggles to find affordable rents as their younger counterparts. Boomers account for one of the largest groups of new renters. According to the State of the Nation’s Housing 2017 report by Harvard’s Joint Center for Housing Studies, 44% of renter growth between 2005 and 2016 was due to households aged 55 and older. A Freddie Mac survey projects that number will grow, finding that 71% of those aged 55 and older expect to rent their next home, and 60% cite affordability as a main factor in their housing decisions. Our own analysis found that 23.3% of Baby Boomers are renting as of 2015 — a relatively small amount for the time being — but they’re the most cost-burdened of every generation in our study, likely due to the fixed incomes that come with retirement or semi-retirement. 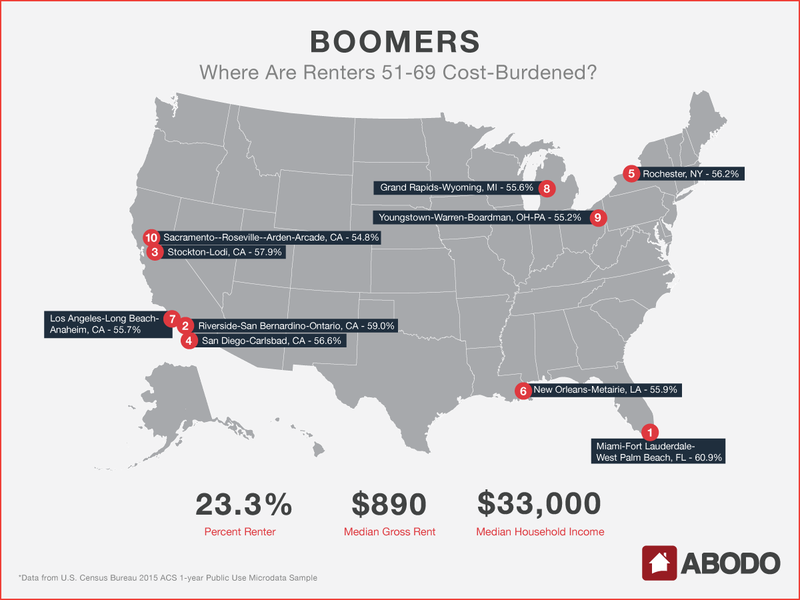 Renting Boomers pay the lowest median rent of every generation as well — $890 — which is fortunate, considering they earn the lowest median household income by nearly $7,000. Renting Boomer households live on an income of $33,000. Miami-Fort Lauderdale-West Palm Beach, FL, has been in the top three for all of our lists. In the Magic City, 60.9 % of Boomers face a cost burden. California, not known for its low cost of living, is another one of the areas where Boomers feel it most, with five of the top 10 most-burdened cities in the Sunshine State. In Riverside-San Bernardino-Ontario, which has appeared in the top 10 for every generation, 59% of renting Boomers are burdened. Living along the coasts is a sure way to increase housing costs and the risks of becoming cost-burdened, but even Midwestern Boomers aren’t immune: 55.6% of renters in Grand Rapids-Wyoming, MI, and 55.2% of renters in Youngstown-Warren-Boardman, OH-PA, are feeling the weight of rent payments. When it comes to renting, conventional wisdom has it that life follows a certain chronology: The young rent, the middle-aged buy, and the senior citizen crowd pays off the mortgage. And while there’s truth to this formulation — 66% of Millennials, 38% of Gen Xers, and 23% of Boomers rent — the reality is more complicated. Increasingly, renting is not the sole province of people in their 20s and 30s. In fact, over 44% of rental growth since 2005 has come from the over-55 crowd, according to Harvard’s Joint Center for Housing Studies. For some, renting is a lifestyle choice. But for many others, homeownership is not a feasible economic reality. Rising rents are a problem for everyone — particularly Millennials with lower earning power and Boomers on fixed incomes. And for Generation X, being cost-burdened can make it hard to save up for a down payment. A high population of cost-burdened renters thus not only influences the rental market and new development — it affects the housing market as well. We used the U.S. Census Bureau 2015 ACS 1-year Public Use Microdata Sample to analyze renter cost burdens in the 100 most populous MSAs. Because the PUMS uses only Public Use Microdata Areas (PUMAs) as the geographic identifier for each record, we used the IPUMS MSA-PUMA crosswalk tables to assign each PUMA to the MSA in which it lies. Occasionally a PUMA intersects multiple MSAs, so we only included a PUMA in an MSA if at least 50% of the PUMA population lives within the MSA. To find the percentage of cost-burdened renter households and answers to how much rent I can afford, we analyzed the subset of records that listed “renter-occupied” as their tenure and used only the record for the householder in order to keep just one record per household. We divided this subset into the three generation groups based on the age of the householder and calculated the percentage of households reporting a number higher than 30 for percentage of household income spent on rent. Using the design-factor method provided in the PUMS documentation, we calculated the median gross rent and the median income nationally for each generation of renters.